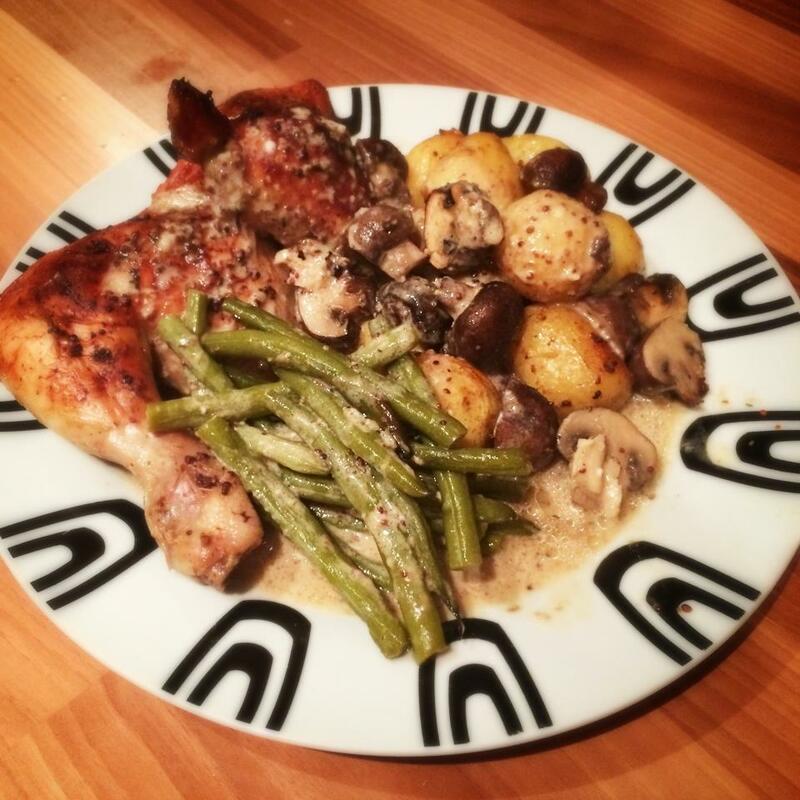 Chicken on the bone is one of my favourite ways to eat meat and so I’m always trying to think of new ways to cook it. Last night, after my OH took chicken thighs out to defrost, a colleague at work mentioned the old crème fraiche and mustard combo. I previously done this with pork and thoroughly enjoyed it so I decided a bit of free styling on this recipe would be worth a try. The result was a real treat. For such a low amount of points the sauce is delicious and creamy and the dish on the whole is so filling! What best about the dish as the majority of it is done by the trusty oven. Once its in, you can all but leave it for 40 minutes. You could replace the chicken thighs with chicken breasts (165g raw breasts for the same amount of points) if you fancy but make sure you really baste as you are going as the chicken might dry out. If you go with the thighs, make sure you leave the skin on until after cooking (don’t eat it!!!!) to keep all the lovely juices inside. Heat your oven to around 180c. Par boil the potatoes in lightly salted water for around ten minutes. While they are boiling, mix together the crème fraîche, mustard, garlic, wine and stock and season (I did this all in the jug that I made the stock up in). Then arrange the chicken, skin-side up, in a roasting tray just big enough for the chicken and vegetables. Drain the potatoes well and then arrange the potatoes, cut side down (so they soak up lots of the lovely sauce) around the chicken. Scatter the mushrooms around the roasting tin too. Pour the sauce over everything in a nice even layer. Cover with foil and pop in the oven for 40 minutes, basting the chicken every now and then if you get a chance. After 40 minutes, add the green beans to the roasting tin making sure they are covered well with the sauce and uncovered, pop back into the oven for another 20 minutes. This will allow the potatoes to crisp up and the sauce to start reducing a little. Remove from the oven and pop the chicken on a plate first, carefully removing and discarding the skin (don’t take this off before cooking or the chicken will need to be constantly basted to prevent it drying out). Next plate up the potatoes, mushrooms and green beans. With the sauce still in the roasting tin, add the parsley give a good mix and then pour the lovely sauce over the finished dish.